President Trump may have killed the TPP but support for free trade in the Asia-Pacific is far from dead. 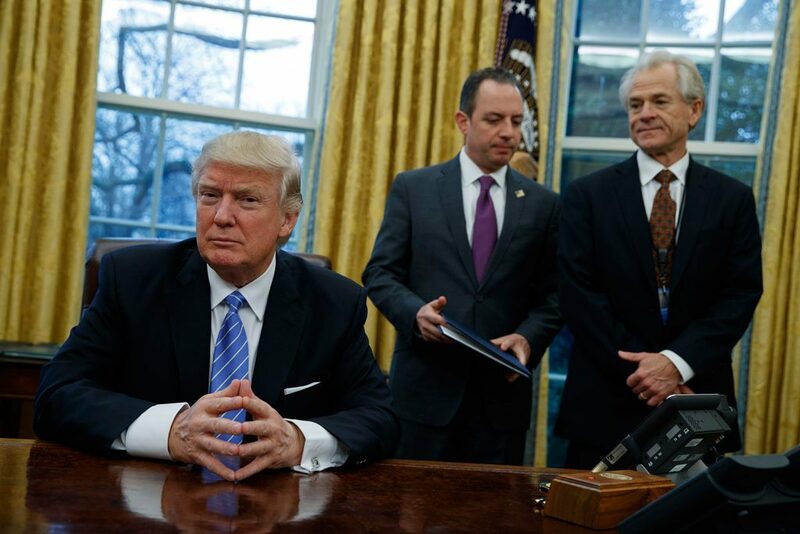 Donald Trump killed the Trans-Pacific Partnership on January 23. The US was the lynchpin of the free trade agreement (FTA); without it, the deal faces a bleak future. The demise of the ambitious agreement, along with its transatlantic counterpart, TTIP, has dampened hopes that large-scale FTAs can revive flagging global trade growth. 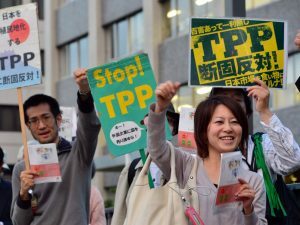 TPP was to be one of the world’s most ambitious FTAs. It included 12 countries that represent around 40 per cent of global GDP and it would have liberalised cross-border services and investment – two areas that traditional FTAs ignore. Under Barack Obama, TPP was also the economic pillar of US strategy for the Asia-Pacific. It aimed to establish high-standard economic and trade norms that favoured the US, along with a trade network that would become the region’s dominant bloc. TPP intentionally excluded China, in the hopes that Beijing would join later and liberalise closed sectors of its economy. Without the US, the other signatories will be unable to pass TPP. Australia has mooted the idea of replacing the US with China but this is unlikely due to the agreement’s demanding liberalisation requirements. 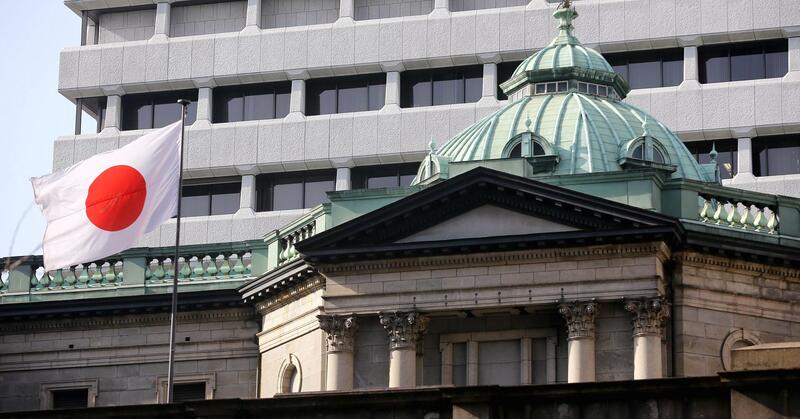 Now that Washington’s out, TPP members may agree to grant each other the deal’s benefits on a provisional basis. This is how the General Agreement on Tariffs and Trade – the foundation of the modern global trading regime – began, so there is a precedent. In the meantime, observers will follow the negotiation of another trade deal: the ASEAN-led Regional Comprehensive Economic Partnership (RCEP). It consists of the ten countries of the Southeast Asian bloc along with the six partners with which ASEAN has existing FTAs. While substantially less ambitious than TPP, RCEP is the sole remaining mega-FTA in the region with a serious chance of being passed. RCEP has some in Washington worried: it excludes the US (Washington doesn’t have an FTA with ASEAN) and a flurry of academic articles have warned about China replacing the US as the regional trendsetter on trade. This is not quite accurate. RCEP is centred around ASEAN, not China, and Beijing is not keen on an overly ambitious deal. It will be former TPP members – particularly Australia, Japan, Singapore and Vietnam – which will be pushing for a more expansive pact. The profusion of bilateral FTAs in the Asia-Pacific has resulted in what some economists call ‘the spaghetti bowl effect’. Rules of origin – the criteria used to determine a product’s source country and any associated tariffs – are overlapping and complex. Companies end up making half-finished products in one country using inputs from a second, ship it to a third country for final assembly, and then sell it to a fourth. This strategy allows them to take advantage of differing rules of origin and export cheaply. This type of trade distortion makes commerce less efficient. Small firms in particular are often unable to decipher the labyrinthine regulation and so can’t source the most cost-effective components for their products. RCEP would fix this by harmonising regulations across a zone encompassing 3.4 billion people. This would allow thousands of small, innovative companies to engage in cross-border trade. 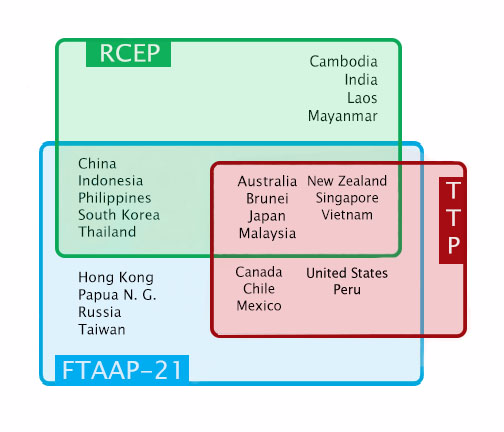 Only a few of RCEP’s members don’t yet have FTAs with each other. The most notable of these are in the China-South Korea-Japan triad. These economic giants have been unsuccessfully negotiating a trilateral trade deal for 16 years and RCEP might finally break the deadlock. It won’t necessarily boost growth much (it will mainly deepen existing trade patterns), but its more important effect could be the improvement of relations in this tense region. The deterioration of Sino-Japanese relations over the East China Sea dispute has resulted in declining investment and trade between the two countries since 2011. This reduces their economic interdependence, weakening a deterrent to war. 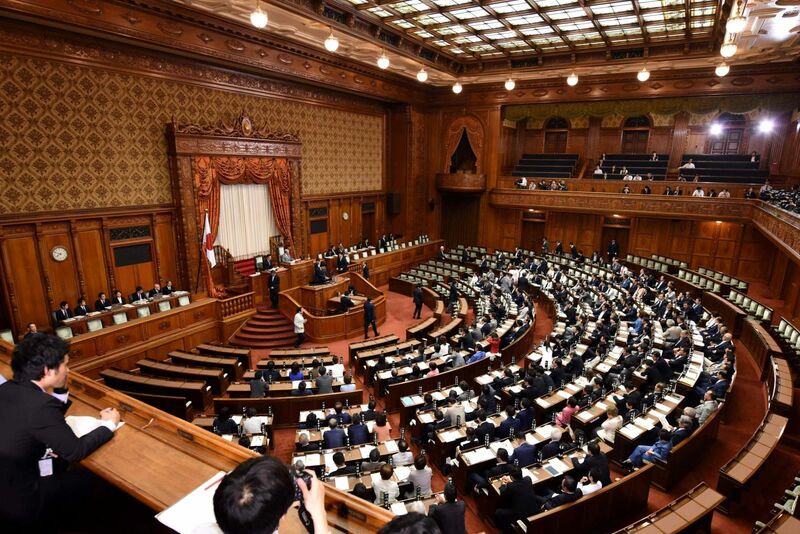 A South Korean-Japanese FTA has also been impeded by historical grievances. These frictions hinder security cooperation against North Korea, which has become more essential now that a neo-isolationist occupies the White House. RCEP could therefore play a key role in improving regional security in Northeast Asia. Another significant outcome of RCEP could be the opening of India’s uncompetitive economy. India faces a tough choice: not ratifying RCEP could reduce its exports to the bloc’s members but joining would damage coddled domestic sectors. Chinese manufactured exports would outcompete Indian ones, and farmers would suffer as cheap, high-quality agricultural products pour in from Australia and New Zealand. India’s social safety net is non-existent, so it cannot afford the social and economic dislocation this entails. Its commerce ministry officials also estimate that their country could lose tariff revenue roughly equal to 1.6 per cent of the country’s GDP. Several factors are speeding along RCEP’s negotiations. 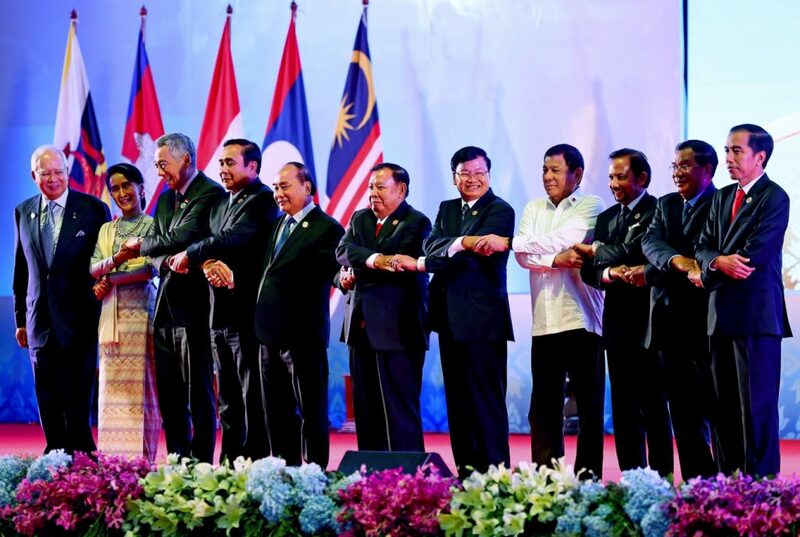 The deal would be a tour de force for ASEAN, which wants to conclude it this year. Chinese President Xi Jinping has stated that he is aiming for an early conclusion as part of his new policy to make China a global leader. TPP’s failure will also make RCEP a higher priority for its members. These incentives will be needed. The final rounds of trade negotiations are always the hardest and RCEP’s members are divided. Advanced open economies desire a wide-reaching agreement whereas still-developing and state-directed economies simply want a harmonised reduction of tariffs. Assuming that RCEP does eventually come into force, it could lay the groundwork for an even bigger free trade zone: the massive Free Trade Area of the Asia-Pacific (FTAAP). This agreement aims to draw in virtually every country bordering the Pacific Ocean but it’s currently a pipe dream. RCEP would provide a pre-existing framework that could then be expanded to the full complement of countries in FTAAP. What will the US do while RCEP is being negotiated? 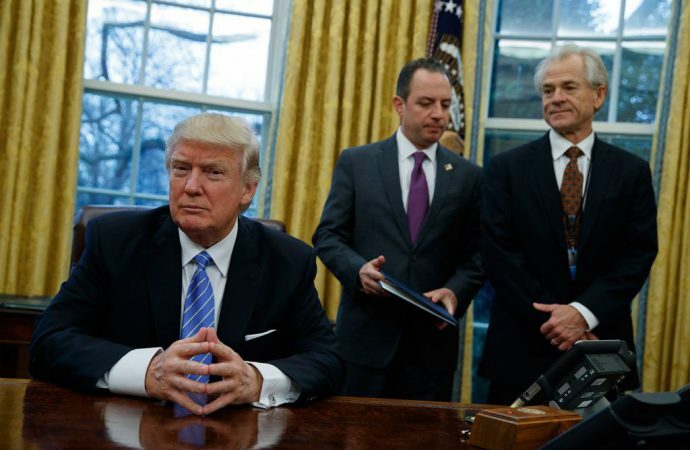 President Trump plans to negotiate (or renegotiate) bilateral deals with major US trading partners. He will start by meeting Japanese Prime Minister Shinzo Abe on February 10, where he will press Japan on reducing non-tariff barriers in its auto sector. Trump will also try to eliminate tariffs on US agricultural exports, and he may decide to use some already agreed upon chapters from TPP. The new president isn’t uniformly against free trade; he has said he likes transparent bilateral deals that don’t harm American workers. But no matter how many bilateral deals Trump signs, they will not compensate for the abandonment – at least for now – of US economic leadership in the Asia-Pacific.